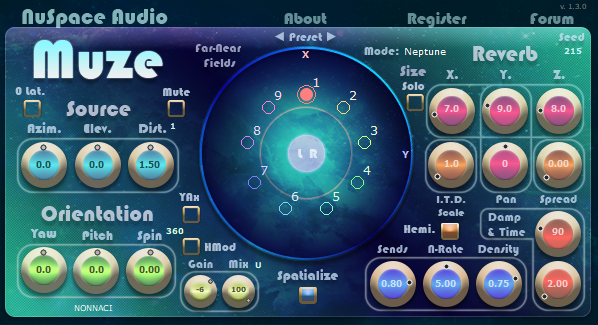 Riviera is a hybrid algorithmic-convolution reverb plugin for modeling specular acoustic reflections in N-dimensional orthotopes. e.g. string, plate, room, tesseract, and up (vooms or volume+room for short). Normally, direct computation in these spaces is expensive but some clever maths [see tutorial (parts 1, 2, 3, 4)] reduced the asymptotic costs to the point of practical use (e.g. 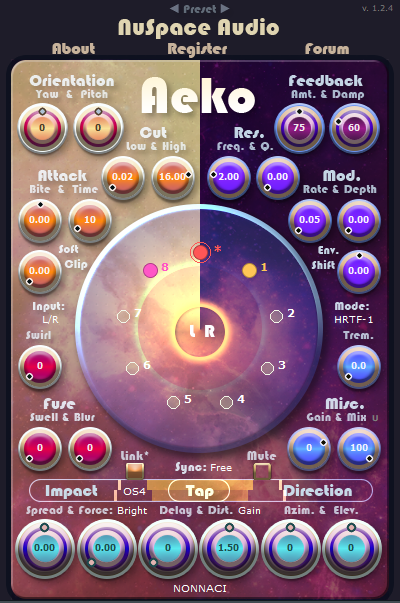 a Reverb plugin). Parameterizing these spaces and then combining them with some fast time-varying frequency dampening resulted in some interesting sounding impulse responses (IRs). Yes, I agree with Tungee. It sounds very interresting, we need it on mac 😉 Thx for your work ! Getting around to it 😉 Any Mac format of choice (AU/AAX/VST)? From my side, a vst would be my favourite. Didn’t know there was a way in the API to report back latency/delay. In any case, FL studio uses variable # frames upper-bounded by the latency in the user settings; plugin processing is one buffer delay of size equal to that user-setting latency. Pro Audio News & Tutorials | mixingroom.de | NuSpace Audio veröffentlicht kostenloses Faltungshall-Plugin Riviera. Oh crumb. i thought there would be an AU as it is listed as such on kvr. oh well. good luck. Nop, not till I get access to a mac. 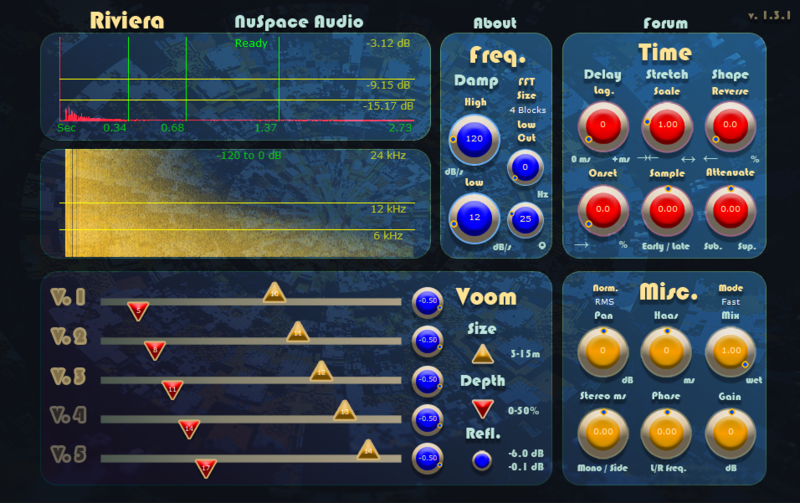 *Each of V1-5 buttons specifies a dimension of the the voom so for example, enabling any 3 of them will put you in a 3D room, enabling any 4 of them will put you in a Tessaract or 4D room (the plugin lets us hear a projection of it like the visual analogy in https://en.wikipedia.org/wiki/Tesseract), enabling only 1 of them will put you on an oscillating spring, etc, etc. *Delay refers to the time onset of the direct sound-source. It’s only useful if you have the mix set below 1 and want the IR to lag behind with the onset treated as a distinct echo. *Stretch in physical terms roughly refers to scaling room-size and listener position from origin before freq. decay kicks in. i.e. make rooms even larger or smaller than what’s possible in the voom settings. *Linearity in physical terms roughly refers to how speed of sound changes over distance or time..
> 0 => starts slow, then accelerates over time. Easiest way to test this is to enable only 1 dimension (e.g. v1) and mess around with the linearity. Thanx for the fast replies! Beta mac OS X 10.7+ version is out. Unfortunately, could only run it my virtual machine so any tests on a physical mac would definitely help. Nonnaci because of Protools 8 icant update to 10.7. Is it possible that you can build it also for 10.6?! Unfortunately OSX 10.7 was the earliest deployment target I could build for. For some reason I couldn’t get the VST3 version to load (in Renoise) … I’m on Windows 10 64-bit, and neither the 32-bit or 64-bit builds of the VST3 version would load – I even tried renaming the files from “.vst3” to “.dll”, no luck. The VST2 versions work fine. 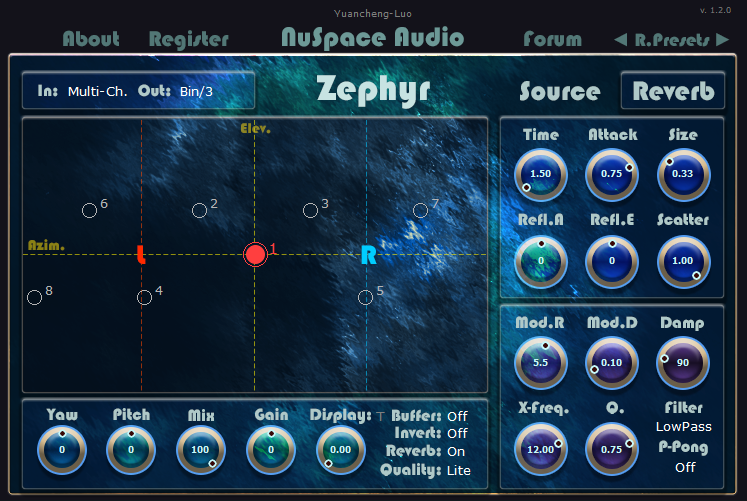 I think Renoise only officially supports VST2 (least by my googling). Tried loading up other VST3 plugins/renaming to dll without much effect. Hmm, does the AU plugin pass logic’s initial verification? FYI, it takes ~10 seconds on my machine. Update: Found the AU validation error. Should be fixed now. Some ideas are being tossed around. I’m open to requests. Thanks for the feedback. Will keep that in mind for future freebies.